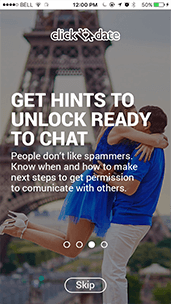 Interact with partners whenever you want from your mobile phone. The more you use the app, the closer you are to real date. intelligence principles to make the best partner suggestion. questions, just simple and fast matches based on your clicks. It’s time to forget about fake profiles and scams. We get rid of all of those. You’re looking for a serious relationship ? and so is your partner to be. Getting a real date becomes fun, easy and effective. 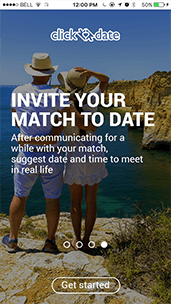 ClickDate is an Intuitive App that Guides You on steps to be taken for having perfect date. place to meet via FourSquare. Fast & Easy. Yet Powerfull. No more hundred-word questionnaires, No more bogus matches, No more senseless swapping. With ClickDate, you need to spend three minutes on important and relevant questions. The rest is done by ClickDates system. For Indian singles looking for a new, effective approach to dating, Clickdate is the perfect place to begin. We are a new matchmaking site that matches singles based on a deeper level. We look to create long-lasting love connections by using a modern approach to psychology. We do this by analyzing behavior. By doing it differently, we feel that these connections are stronger and more meaningful. We are not one of those free online dating sites that don’t provide assistance. We don’t expect you to just swipe right and left in the hopes that someone will respond. We have an innovative approach to matchmaking as compared to other dating sites. Why is ClickDate Different from other Free Indian Online Dating Sites? We are different because we match singles in relationships that have real meaning. Instead of giving you pages of questions to answer upon registration, we analyze every click that is made to interpret your matches based on your preferences and statistics. By making matches based on your behavior, we know what you are looking for in real life. The people that we match you up with truly complement your personality, giving you a real shot at love that lasts forever. There is a unique approach to the psychology behind our matchmaking system. With other dating sites, you are expected to create an attractive profile to be able to catch someone’s attention. We eliminate this process by analyzing your preferences, and those of all potential partners. On other sites, users fill in their profiles with inaccurate information. Many people tend to present themselves in a way that they want others to see them. Sometimes, users’ profiles do not reflect who they really are. At ClickDate, you will answer a few simple questions. You specify your main “want/don’t want” and “important/not important” traits, and we do the rest. Users don’t waste their time communicating with people who they are not compatible with. At ClickDate, you find true matches. 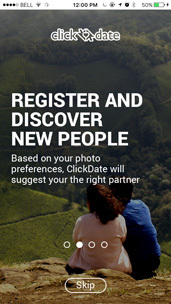 With ClickDate, dating is fun! You are looking for true love, and so are your matches. By combining behaviorism with artificial intelligence principles, we learn what you are looking for in a relationship. By analyzing every step of the communication process, our system knows when you are ready for that first meeting! You and your match can set up a first date via Foursquare. When you meet your match, you’ll find that he or she is a great partner for you, laying the foundation for a lasting relationship. We want Indian singles to get on board! Other sites take your credit card information and leave you to navigate hundreds, if not thousands of profiles on your own. That is not the way to find your perfect match. Our system works with users to determine if they have created an accurate profile. Who you see online is who you will meet in real life. With ClickDate, you get all of this, and best of all, there is no cost! Don’t Wait, start right now! What are you waiting for? With ClickDate, there is no reason why you shouldn’t find your perfect match. We are an honest, realistic dating site, and we want you to find true love. Meet other singles, and take the first step in changing your status from “Single” to “Taken” when you register with ClickDate!